representatives of several organizations including the Executive Director of the Climate Action Network, the UNFCCC Focal Point for Education and Youth, and Freie Universitat in Berlin to discuss building on SEPN’s International Policy Forum discussions towards international collaborations on climate change education global monitoring. 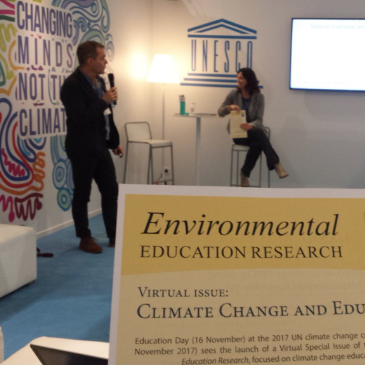 Also during COP, a new virtual special issue on Climate Change Education in the journal Environmental Education Research was launched. The issue was co-edited by Drs. McKenzie and Reid and is available (open access) through http://explore.tandfonline.com/content/ed/ceer-vsi-on-climate-change.